I set out the other night with a goal to gather the necessary wood to make a shooting board. 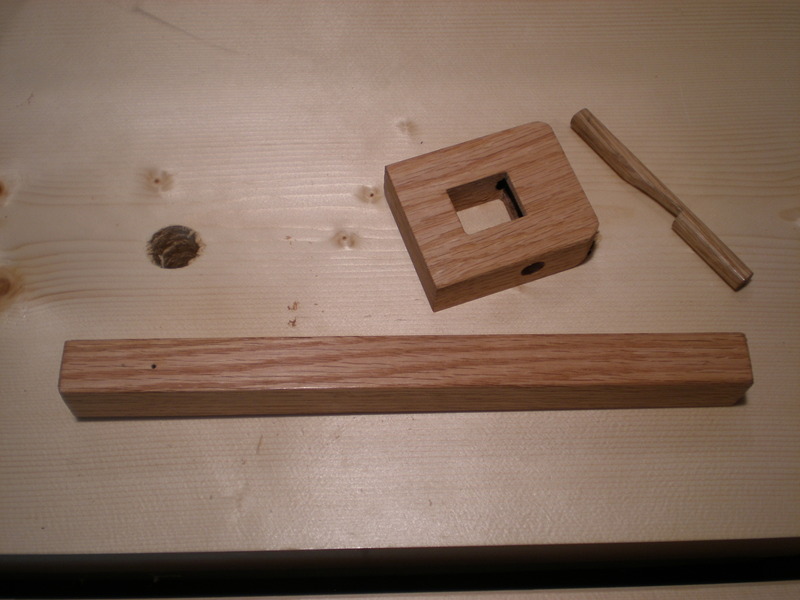 Somewhere along the way I decided to make this marking gauge instead…not sure what happened. Things pop into my head and I run with them sometimes. I still have plans to make a shooting board…I’ll blog about it for sure. I’ve been doing some research lately and finding that many woodworkers keep saying it’s better to have more than one marking gauge on hand. After building the Nicholson workbench with all of its mortise & tenons, I get where they are coming from. 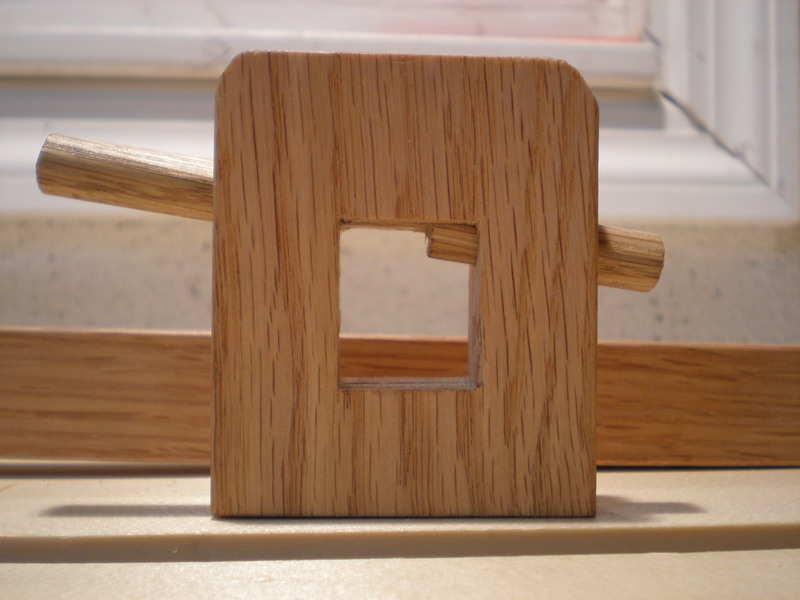 It would have been nice to have a couple gauges set for the project…instead of moving the setting for each part of the mortise & tenon. When the thought popped into my head the other night, the first thing I thought of was the podcast that Bob at the Logan Cabinet Shoppe had done on making a marking gauge. Yeah Bob! I quickly loaded it up onto my pod and took it into the workshop. The gauge consists of only four parts…the beam, pin, wedge, and beam holder. 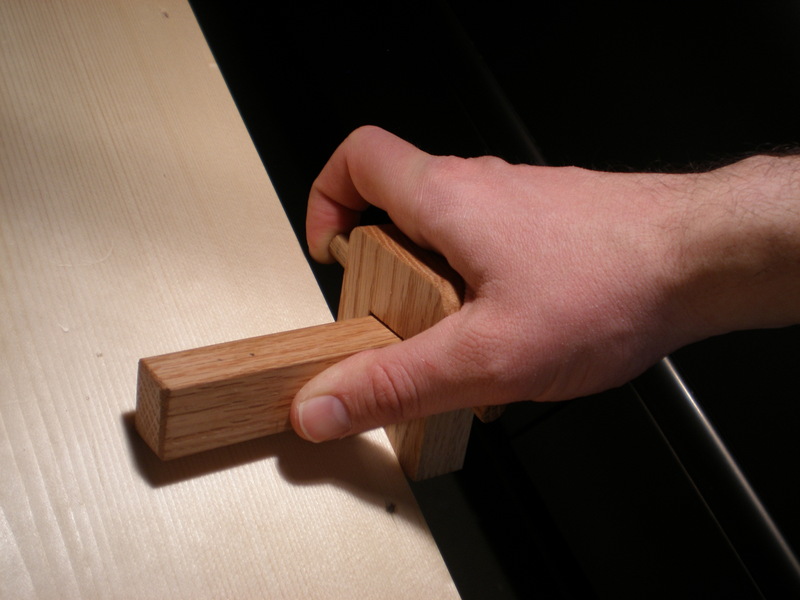 The wedge puts the pressure on the beam to lock it in place during use, and unlocks the beam for adjusting. I think the hardest part was finding the pieces of wood from the scrap pile. I ended up with some nice cutoffs of red oak. I only had to trim the pieces to width and plane them flat and square. 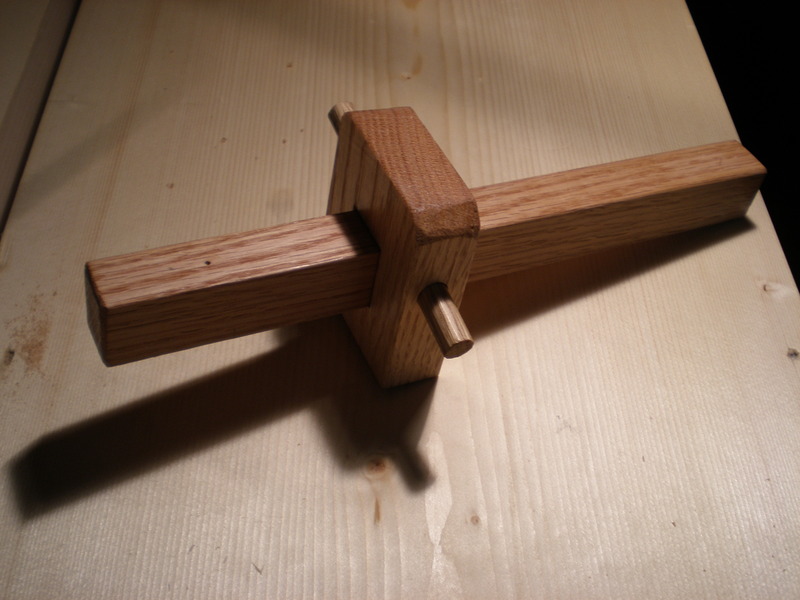 I marked out the mortise for the adjustable beam first according to Bob’s podcast. 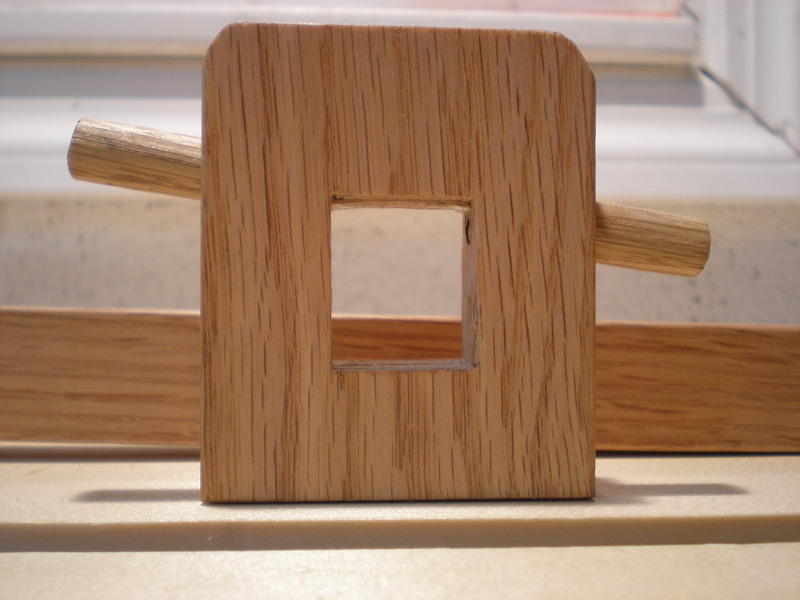 I cut the mortise with chisel and mallet coming in from both sides of the wood so as not to blow anything out. I then cleaned up the piece of wood I had for the adjustable beam with some planing work. I finished planing with the smoothing plane to sneak up on the perfect fit in the mortise I had cut. I stopped there for the first night…I needed to contemplate how I would proceed with the wedge mechanism that locks the beam in place during use. I decided to take the easy way out and go for the dowel method. I had an oak dowel left over from the drawboring on the Nicholson bench, which nicely matched the tone of the red oak in the rest of the gauge. I followed the podcast and cut the necessary wedge shape on the dowel. After a couple of trial and error…ok, more like ten, I had myself a functioning gauge…minus the pin. As far as the pin…I was able to find a small finish nail. I have no idea what size it is. It was in that bin with all the other randomly sized nails that just about everyone has. I clipped off the head and super glued it into a pre-drilled hole on the bottom of the beam. I gave the marking gauge a run about a half hour later with success. A little shaping and a few coats of shellac and I called it done. It should make the next project just a little bit easier. I could see myself making some more of these…could you have too many? This entry was posted in hand tools, VCF, woodworking, workshop and tagged hand tools, marking gauge, woodworking, workshop by villagecustomfurniture. Bookmark the permalink.